As this Short Break departs at 7.15am, accommodation will need to be pre-booked for the previous night. Cruise on the Adelaide River, home to over 1,600 crocodiles, on the Jumping Crocodile cruise. See these prehistoric creatures up-close as your local guide entices the crocodiles to leap out of the water. Then you’ll travel into Kakadu National Park. 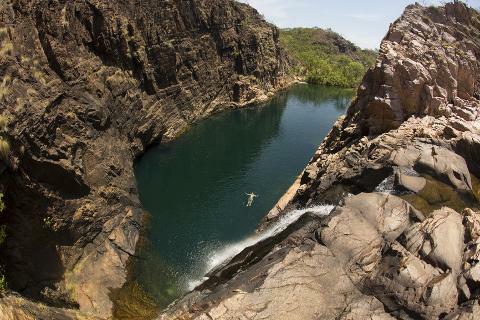 Covering more than 20,000 square kilometres, World Heritage listed Kakadu. The combination of mangrove fringed coastal areas, expansive flood plains, lowland hills, and open woodland and forest habitats, make Kakadu one of the most diverse landscapes you’ll ever experience. It’s home to a myriad of animals, hundreds of bird species and thousands of different insects and plants. Enjoy lunch in Kakadu National Park before a stop at the Bowali Visitor Centre. Continue to Ubirr, where you’ll climb up through the ancient Aboriginal rock art galleries, believed to be 20,000 years old, to the lookout for a view over the surrounding wetlands..
Hotel: Mercure Kakadu Crocodile Hotel (Superior), Kakadu. A scenic flight is the ideal way to appreciate the sheer scale and beauty of Kakadu and the Arnhem Land Escarpment. You’ll discover winding rivers, spectacular 1.8 billion years of continuous erosion, billabongs, flood plains and view the Archway, East Alligator River Valley, Mikinj Valley Billabongs and Magela Floodplains. Hotel: Ibis Styles Katherine (Superior), Katherine. 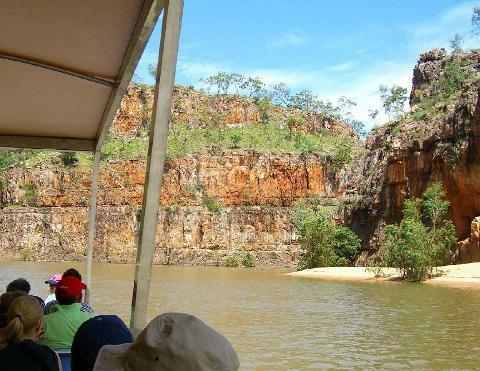 Enjoy a morning cruise through Katherine Gorge and watch for crocodiles basking in the sun. Then proceed to the informative Nitmiluk Visitor Centre for an opportunity to look around, before continuing to Edith Falls. The paperbark and pandanus fringed natural pool at the base of the falls is safe for swimming throughout most of the year (conditions permitting). Stop at Adelaide River War Cemetery, en route to Darwin. 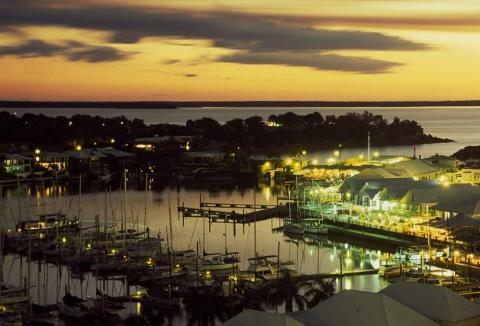 Hotel: DoubleTree by Hilton Hotel Esplanade Darwin (Superior), Darwin. Follow the Stuart Highway via Batchelor to Litchfield National Park. View Florence Falls before making your way down the stairs to the plunge pool below with an opportunity to swim. 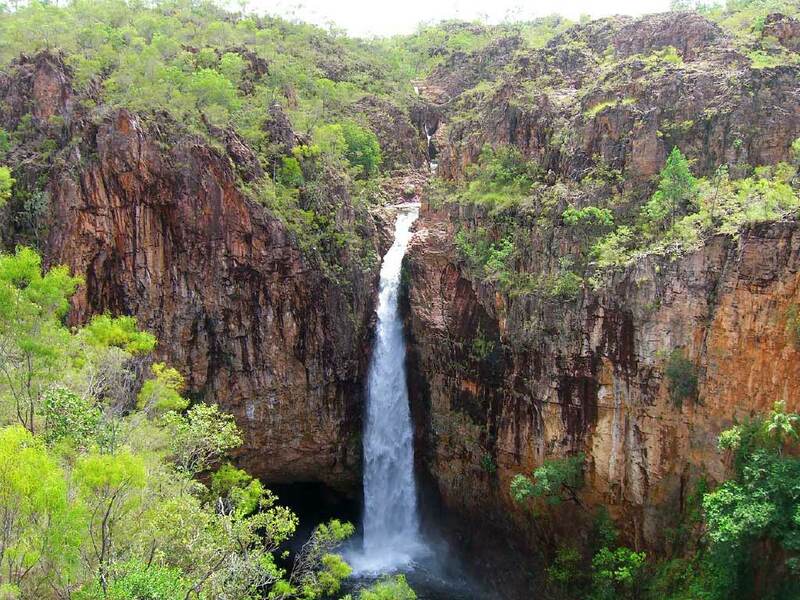 Visit Tolmer Falls for a magnificent view of the water cascading down to the deep waterhole below. Venture to Wangi Falls for another opportunity for a swim in the large crystal-clear pool and an optional steady climb through the rainforest to the top of the falls. You’ll stop for a picnic lunch. A great day also for taking many interesting photos, including the amazing stands of termite mounds. Return to Darwin, arriving early evening, where your short break concludes. As this Short Break concludes at 6.00pm, you may like to pre-book accommodation for tonight. Please Note: This itinerary is valid for travel from 1 April 2016. Due to seasonal conditions this itinerary may change without notice. Green season itinerary operates Nov – Apr see tour DG55 (Day 2 overnight in Darwin instead of Katherine). Kakadu: Small amount of walking including a 10-15 minute walk on uneven ground with a gradual climb to the viewing point. There is wheelchair access, however, this is on uneven ground and is accessible for only a small part of the walk and must have a carer to assist. Katherine: Small amount of walking.